At 2 km's into the run, Buckingham shows the way and has a +5:24 advantage on McDonald, while Zyemtsev has nudged his way into third (+5:29) over Garcia (+5:54). Daerr rounds out the top five, +6:30 off the pace. Zyemtsev is now running in second +5:20 behind Buckingham. Garcia is returned to third overall (+5:40) as McDonald falls back to fourth and is running with Daerr, +6:10. 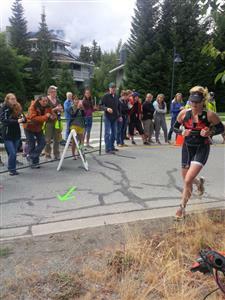 Mel McQuaid is the first women off the bike here in Whistler. At 8 km, on Zyemtsev has starting to chew into Buckingham's lead. Currently, Buckingham has a +4:25 lead on Zyemtsev with Garcia at +5:27, Daerr +5:43 and McDonald at +7:14. 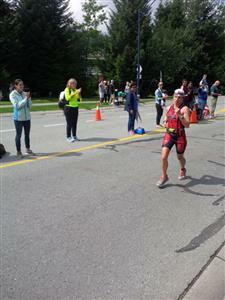 The next two women have come into T2. 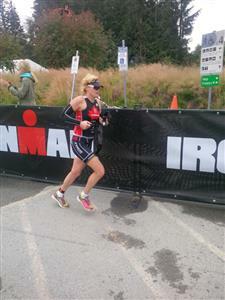 Danielle Mack is +5:24 back while and Jessica Fleming +5:26. Jessica Fleming heading out on the run in third. Makenzie Madison heads out on the run in fifth. 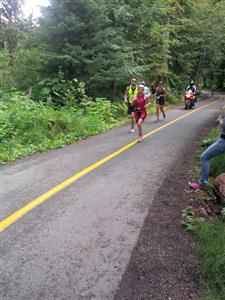 McQuaid is holding off Mack (+5:28), Flemming (+5:49) and Donavan (+10:53) behind her at 2.2 Km's. 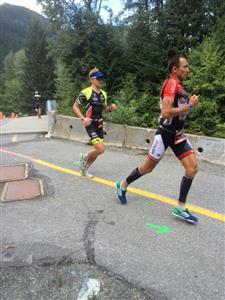 At 13 km's, Buckingham's lead has been reduced to +3:03 on a hard charging Zyemtsev in second. Daerr is now running in third, +5:03 while Garcia is hanging tough in fourth, +6:02 off the pace. 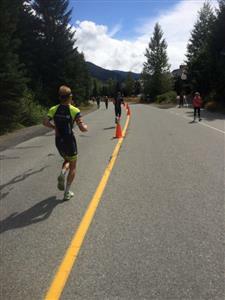 Justin Daerr running in third at 13 km's. Buckingham's lead has slipped to +2:13 by Zyemtsev at 17 km's. Daerr is closing in too, and is running just +4:46 back of the leader. Garcia in fourth, +6:52. McQuaid is opening the gap up on all those behind her. 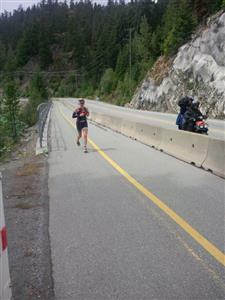 She has leads of +6:16 on Mack and +8:34 on Flemming at 8.2 km's. McQuaid running at 12 km. We had a report that a scooter clipped her foot, but she shook it off and continued on like nothing had happen. Tough lady! McQuaid's lead is now up to +6:33 at 13 km's. At 22 km. Zyemtsev has reduced Buckingham's lead to seven seconds at 22 km. Lead change should be soon. The gap between Buckingham (out front) and Zyemtsev at 24 km's. All the women are loosing ground to McQuaid up front. At 28.2 km, Buckingham has Zyemtsev so close to him, he can smell the flavor of the GU he just ingested on his breathe. Lead change. 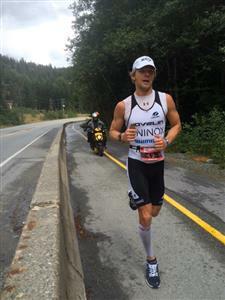 Zyemtsev has runs his way to the lead of the 2015 Subaru Ironman Canada. McQuaid looking good in the lead at 21 km's. Some race tactics going on the men's race up front with Buckingham hanging off of Zyemtsev's shoulder as the lead pair run through 30 km's. 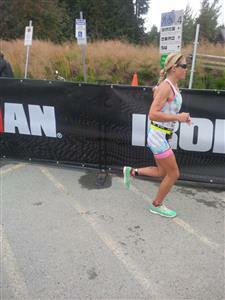 Danielle Mack solidly in second with third almost six minutes back. Zyemtsev has nudged his lead up to 6 seconds on Buckingham as the lead pair run through 33 km's. Buckingham has reclaimed the lead but Zyemtsev remains on his shoulder. What a race! Buckingham with a slight advantage over Zyemstsev. Now Zyemtsev moves to the front at 35 km. McQuaid's lead has slipped to +4:40 to Mack at at 25 km's. Mack clawed back about 40 seconds on the leader over the last 2 km's. 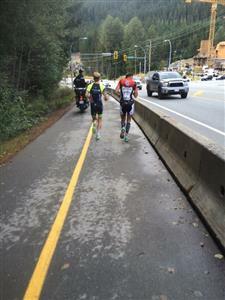 Buckingham and Zyemtsev running shoulder to shoulder at 37 km! Who cracks first? 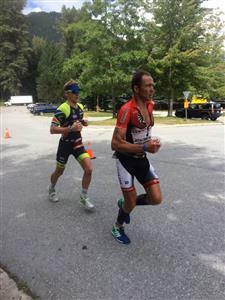 In 2010, Zyemtsev ran with Christian Brader for much of the second half of the run at the 2010 Ironman Canada and waited until the final 400 meters to sprint away from the German for the win that day. At 39 km's Zyemtsev put in a surge and Buckingham couldn't respond. Zyemtsev has a clear lead and only three km's to go the finish line. 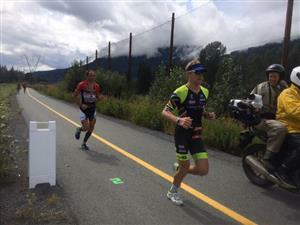 Zyemtsev surges on Buckingham for the lead at 39 km's. 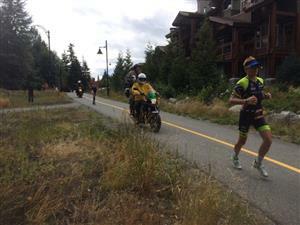 McQuaid has 4:40 lead on Mack at 28 km's. 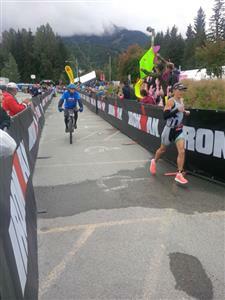 Viktor Zyemtsev is your 2015 Subaru Ironman Canada champion. 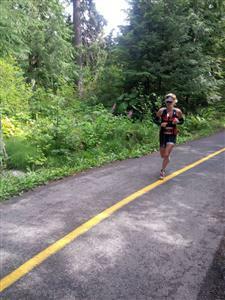 Mack running in second has reduced her deficit to 4:20 at 30 km's.